Home » Are two plants better than one? Are two plants better than one? Why do we ask you to observe multiple individual plants in Nature’s Notebook? For your Nature’s Notebook plant observations, we ask you to observe 2-3 individuals of each plant species at each of your sites, if you have them available. Why do we ask you to do this? Observing more than one individual plant allows you to capture the individual variation in phenological events that can be caused by many factors – differences in genetics between individual plants, the age of your plant, the health of your plant, microclimate differences in one part of your site versus another, and even the amount of sunlight your plants receive. Observing multiple individuals can also be important for species that are dioecious, with male and female flowers on separate plants. Observing at least one of each male and female plant gives a better picture of phenology for that species. If you only have one individual of a species available, should you still observe? Definitely yes! Any observations are worthwhile, and with enough observers, we can produce a picture of what is happening on plants across the country. From the perspective of the person who will be using your data, submitting observations on multiple individuals produces a more accurate picture of the timing of phenophases for a species at your site. It allows you to capture the natural variation in timing and duration of phenophases within a species. This will inform researchers how long your tree species have leaves, which has implications for carbon sequestration, and the comparison of satellite information to on-the-ground observations. Knowing when fruits are available and for how long helps researchers and managers understand when food is available for wildlife. And if there were no flowers or fruits detected at your site in a particular year, observing multiple individuals helps researchers know whether this observation was affecting a single individual or uncovered a pattern observed among many individuals. Once you start observing multiple individuals, you might see the timing of leaf-out, flowering, or fruiting occur days or weeks earlier on some of your individual plants. Let’s look at an example from one of our staff here at the USA-NPN National Coordinating Office. 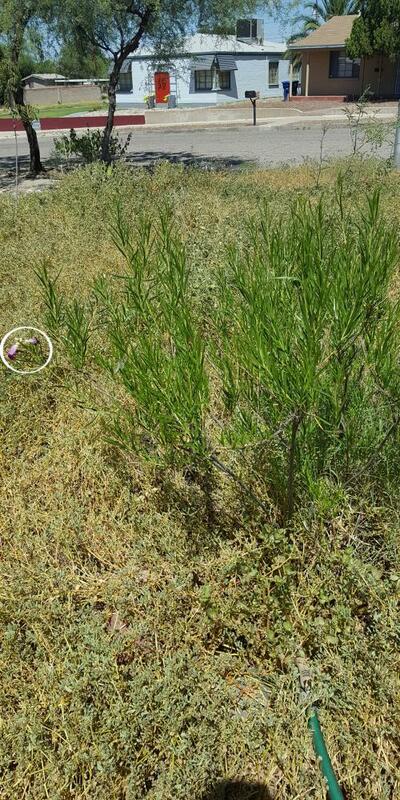 Sara has three desert willows in her yard. These are all trees of about the same age, that were planted at the same time and receive about the same amount of water. This summer, Sara observed that her three trees did not all flower at the same time. As you can see in the photos below, all taken on the same day, the first two trees have flowers, but the third tree does not. Let’s take a look at what Sara observed on her trees over the entire summer, in the phenology calendar below. 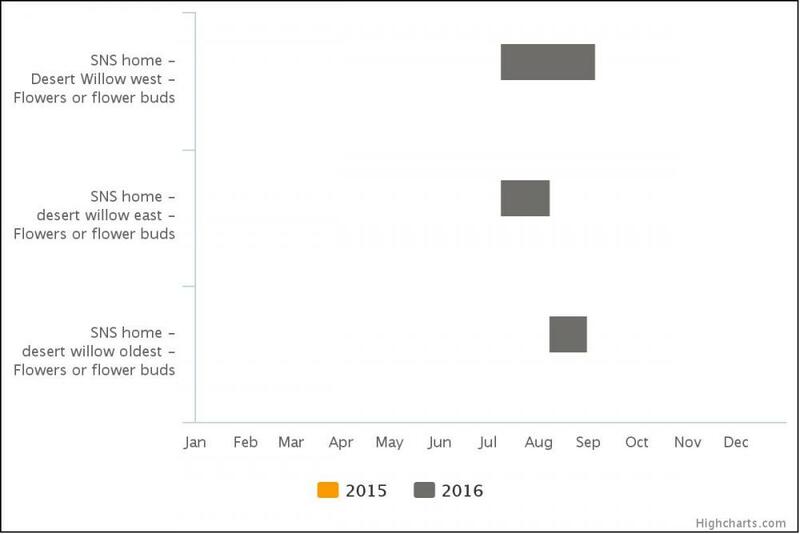 The gray bars indicate the duration of when Sara reported a “yes” observation to the phenophases “flowers or flower buds” for three different individuals. The bar starts when Sara first indicated a “yes”, and ends the next time she reported a “no” for this phenophases for each individual tree. This difference in flowering could have to do with the placement of the trees and the differences in water, temperature, wind, and sun they experience, differences in the soil that the trees are growing in, or the genetics or health of the trees themselves. If Sara was observing only one of the trees, let’s say the third tree on the graph, she would have recorded that flowering of desert willows at her site began in mid-August and ended in mid September. If she was observing only the second tree, she would have recorded that flowering began in July and ended in August. But by looking at all three trees at one site, we can see that flowering at her site began in July and ended September. 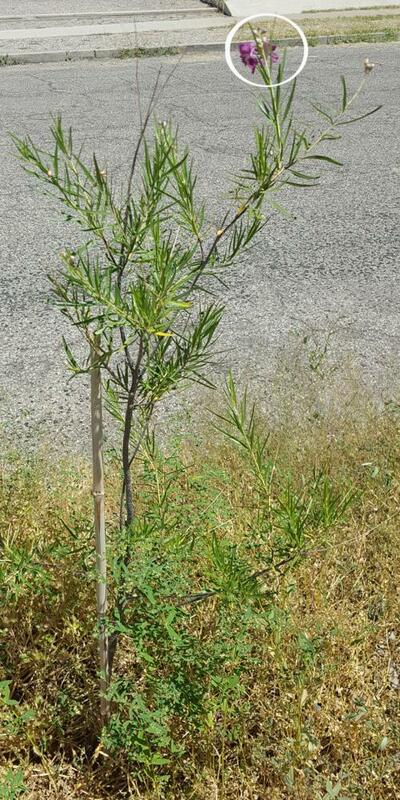 This is a more accurate picture of the phenological patterns of the desert willow species at Sara’s site. Why does this matter? 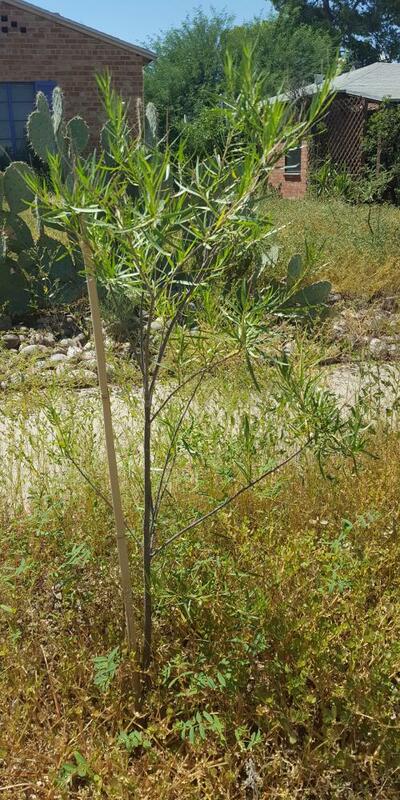 If a researcher was interested in the availability of desert willow nectar for pollinators, or the ability of desert willows to be pollinated and form seeds, monitoring three trees would give a more accurate picture of when flowers were available for pollinators and pollinators for flowers. To ensure the most accurate picture of phenology at your sites, try to observe at least two and preferably three individuals of each species. If you are not familiar with your species, you can always start by observing a single individual plant at first to get the hang of observing that species, and add more individuals later when you feel more comfortable. Enjoy the uniqueness of your individual plants, and have fun making comparisons of their phenology!